I have combined some simple tool for running Rsync server on Windows 7, i took them from various poppular project like Cygwin, CwRsync, and Instant WIndows Rsync Server from Winsupport, and to make my life simple i created some simple script and config file to running Rsync server. rem Ask which drive is to be shared and create the rsyncd.conf file. echo server when you are finished. echo.Close this windows to stop Rsync Server !!! And save it as rsync.bat and double click it to run rsync server. soon after double click it you will see the Dos Prompt window show up. Close that windows to stop rsync server. 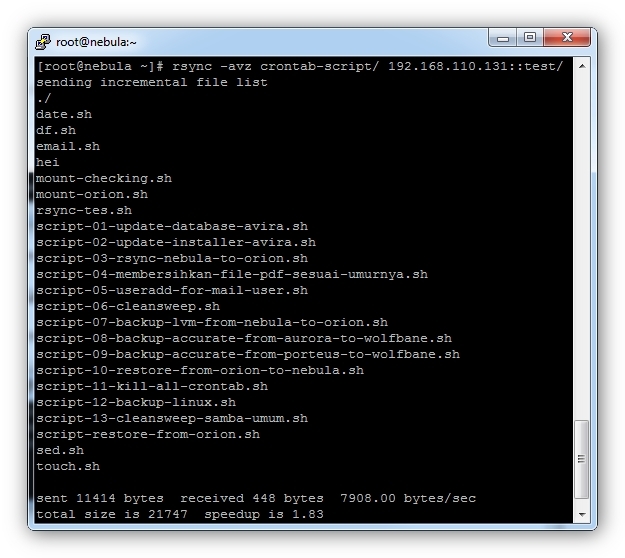 Now it is time to check our new rsync server. And yes, my files transferred ^^. 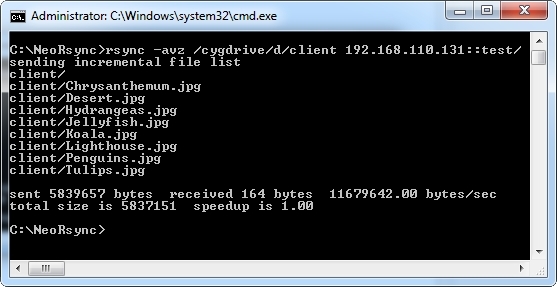 In Linux world you don't need type /cygdrive/x because cygwin want emulate linux environment on windows, that why it created some layer to accesses windows drive using /cygdrive/windows_drive. Actually I was using deltacopy as an alternative to rsync and its good but at times it disappointed me with its slow speed. So I searched for an alternative and found that GS Richcopy 360 works really well, its multi threaded file transfer makes the process lightning fast. For me time is everything and this software helped me save time. Try it, Thanks!